Every year you go through the same thing; you need to deal with pesky leaf cleanup. Leaf removal is not only tiring but painful. Now we have a rake alternative that guides you to placing your leaves on a leaf tarp that is specially designed to withhold the raking of leaves onto a Leaf Lugger. This leaf tarp is made with smart tarp technology which has stiffeners built in, to prevent it from folding, and the mesh on the outside prevent it from bending or buckling in the wind. Leaves, we have them every year, and in fall they clutter your yard, sidewalk, and driveway. Then, because you don't deal with them right away, they sneak into your house, your garage, and even your car. The leaves need to go and you could spend countless hours raking them into beautiful piles. Then you take a short break and you find that the wind just took control of your hard work and blew them all over the place. Next, you decide to bag those darn leaves. What happens, you strain your back bending over trying to either rake or grab the leaves and place them into a bag that is also blowing in the wind. Even after you rake those leaves you realize that the bag is full and your beautiful lawn now has spots of little pieces of leaves crumbled into it. Again you have to bend over and rake those little left over leaves into a smaller pile except you have to do this for every pile you made and at each spot you loaded up the leaves into a bag. Doesn't it seem that you are actually doing twice the work. Visualize how the day would go: you rake leaves, you place them in bags, you bend over again and again to try to get all the leaves up, and then you end up raking again for one final clean sweep. Hours go by and you are beyond tired because you spent the day outside in the sun, bending over, moving your arms, and lifting bag upon bag to the curb. Isn't there some sort of leaf cleanup alternative? Yes, leaf removal can be much quicker, less painful, and cheaper. The Leaf Lugger can be reused over and over as well as save energy that would be wasted trying to keep the ground 100% leaf free. 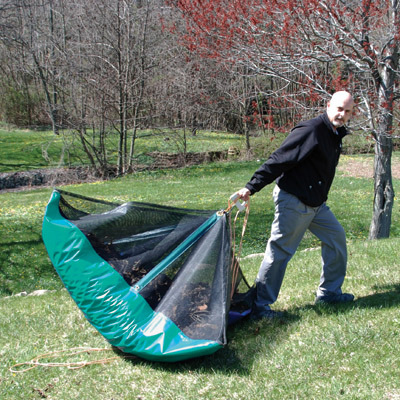 Leaf Lugger is a leaf tarp that can be placed quickly and easily in your yard or garden to collect leaves. Once you are finished raking, just pull the rope which turns your leaf tarp into a giant bag that removes the leaves without a mess.